Middle Child’s new show Us Against Whatever is set in a karaoke bar in Hull. Josie Morley and Edyta Budnik play Steph and Anna, one born and bred in Hull, the other relocated from Poland. The sprawling narrative orbits their personal tragedies and the love they find together. The show has been co-produced by theatres in Hull and Liverpool, both port cities that have been faced with economic decline and fought for regeneration; both are still dealing with the impact of austerity imposed by a distant government. Maureen Lennon’s play, written in collaboration with Nastazja Somers, is performed in both English and Polish. The dialogue is dense at times but the stories it tells are simultaneously personal and universal. The karaoke theme is underlined by the bilingual text projected onto the backdrop. 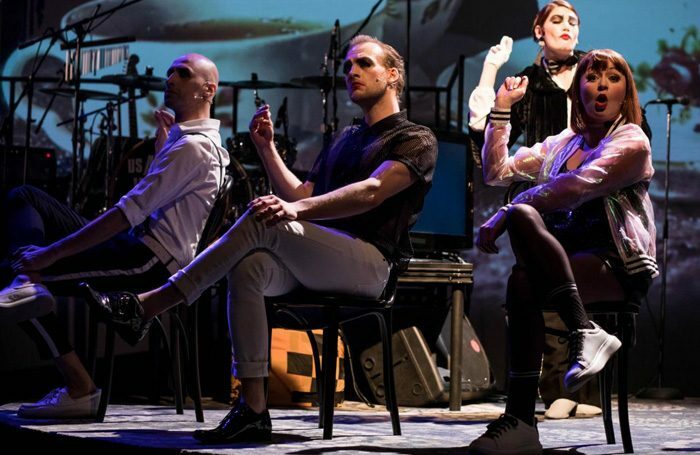 James Frewer’s score begins in Kurt Weill cabaret territory and explodes into numerous different styles. Under Paul Smith’s direction the performances are electrically charged and the show address its themes with fierce intensity. Although the first act is over long and the pace sags part of the way through, the overall effect is of a breakneck journey. A sign at the back of the stage declares: “This will never not have happened.” Repeated in the text, this statement is as true of the show itself as of the impact of Brexit, whatever its outcome.